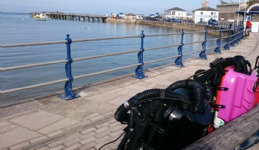 You might not dive ancient wrecks or explore deep virgin caves for a living... but your rebreather should be built like you do. When we say that the Sentinel RedHead is 'engineered for exploration', we really do mean it - the Sentinel RedHead is built from the ground up to meet the demands of the most challenging environments. The Sentinel RedHead combines class-leading performance with a simple user interface combined with a new robust, modular assembly that makes the unit both easier to maintain and travel friendly. Certified to the most stringent 2013 CE test standard, the new RedHead marks the development of a new generation in exploration-grade closed circuit rebreather technology. An evolution of the Sentinel Expedition, the new Sentinel RedHead offers multiple upgrades on breathing performance, weight, reliability, field servicing, travel flexibility, PO2 tracking, configuration and software.